"This is a standard recipe in Maine, especially if you live in a seaport town. Best if made the day before you want to serve it. Serve with oyster crackers." Saute the lobster meat gently in butter until butter turns pink. Add half and half slowly. Heat over medium heat until hot. Do not boil. Serve with oyster crackers and enjoy! 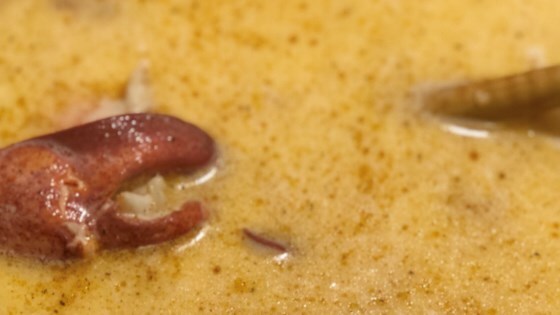 Try 1 stick of butter, 1 T of paprika, 1 lb of lobster, 2 cups whole milk, 2 cups evaporated milk, 2 cups of heavy cream. This is based on Morrison's of Portland, ME famous recipe. Thanks Marion. I grew up in Maine, but now live in the Midwest. I remember my Mother making this fabulous stew every Christmas Eve. Your recipe tastes just liker hers! I'm a Mainah and this is absolutely, authentically, MAINE. Delicious. We used a little extra lobster, but we were a bit piggish about it!